Adopted on June 22, 1931. The ruffed grouse, (Bonasa umbellus,)was adopted as Pennsylvania's state game bird on June 22, 1931, the same day its state tree was adopted. 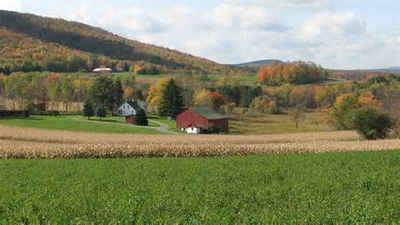 Little has been recorded about the grouse's adoption. 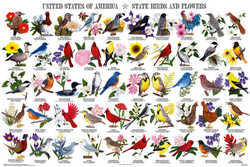 It was championed by Mrs. Harry J. Shoemaker, Chairman of birds and flowers and the officers of the State Federation of Women's Clubs. The Ruffed Grouse, (Bonasa umbellus,) is a medium-sized grouse occurring in forests from the Appalachian Mountains across Canada to Alaska. It is non-migratory. The Ruffed Grouse is frequently referred to as the "partridge". This is technically wrong - partridges are unrelated phasianids, and in hunting may lead to confusion with the Grey Partridge. 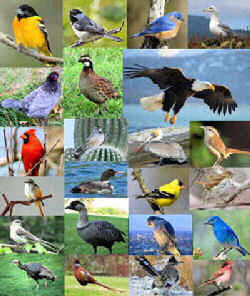 That species was introduced to North America from Europe; it is a bird of open areas, not woodlands. 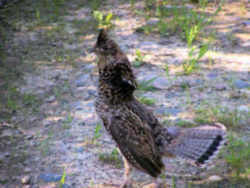 Identification Ruffed Grouse aka "partridge"
The Ruffed Grouse is approximately 18 inches in length. The color is two-toned reddish-brown and spotted on the back, and yellowish with dark bars beneath. The tail has 18 broad feathers, which appear to be half-diamond shaped when spread. The tarsus is partly feathered. 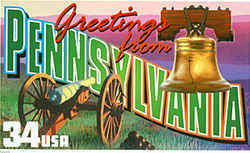 Pennsylvania has not adopted an official state bird at this time. However, the state has adopted the ruffed grouse as the official state game bird (1931). Settlers relied on this plump, red-brown bird with the feathery legs as part of their food supply. Sometimes called a partridge, the Ruffed Grouse is still a familiar sight in Pennsylvania's forests. 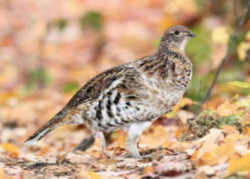 The ruffed grouse (Bonasa umbellus) is hereby selected, designated and adopted as the State game bird of Pennsylvania. 1931, June 22, P.L. 662, § 1. Taxonomic Hierarchy: Ruffed Grouse aka "Partridge"